There's more beautiful weather on the horizon. The highs will be in the mid 80 with the lows in the low 30s. Smoke has not been any problem. The surface temps are slowly climbing in to the 70s. Look for the temps in the low 60s on the bottom. Most of the fish are moving out to deeper water with the warmer water temps. The fish are still concentrated in the middle of the lake. You want to be fishing in 8-15 feet of water. Rainbow and Rocky point is still fishing good in 10-16 feet of water. The hatches are still huge. Damsels, Callibaetis and midges are all over the place. Stripping Damsels, Callibaetis and Perch will get some good tugs. Another good choice would be the Dam for the last couple hours of the day. Make sure to have a very large streamer like a Double Bunny or a Bandit Leech on your line. #10 Halebopp Leech, #10-12 Damsel in Distress, #14-10, Hornburgs #12-10 Punk Perch in Olive, #12-10 Matukas, #10-8 B/H Pop's Bugger in Brown or Olive and #4-8, Zonkers in White or Olive. Guide's Hint: You will have great fishing if you can find water temps lower than 60 on the bottom. 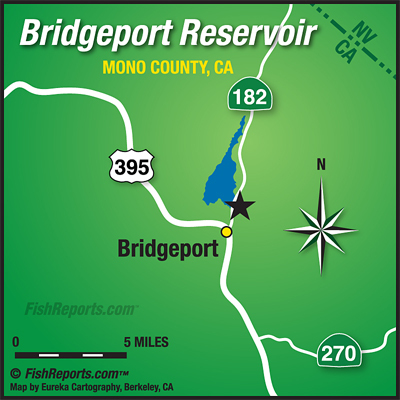 Guide's Hint: You will have great fishing if you can find water temps lower than 60 on the bottom. Crowley Lake: Crowley Lake University coming soon!